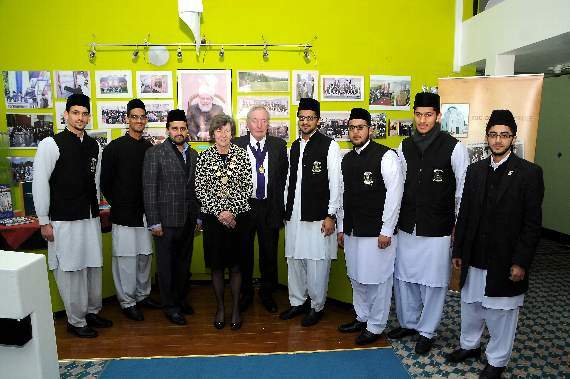 TOWN mayor Melanie Odell was special guest at the open morning at Jamia Ahmadiyya UK’s Institute of Modern Languages and Theology, in Haslemere, at the end of last month. The annual open house event at the Islamic academy is held to forge closer links with the town and provides an opportunity to look around the school and meet staff members and students.Teacher Attaul Moman Zahid said: “The Open House of Jamia Ahmadiyya United Kingdom is arranged especially for our neighbours in Haslemere.“As Muslims it is our duty to treat our neighbours with great respect and honour. We open our doors so that you may see what now dwells among you at the Branksome Place. “We hope this gesture of friendship serves as a means of bringing us closer.”Jamia Ahmadiyya has campuses around the world.Founded in 1906, it is the main centre of the Ahmadiyya Muslim Community for Islamic learning, and the movement’s world head Hadhrat Mirza Masroor Ahmad, officially opened the Haslemere college on October 21, 2012.At the Haslemere institute, students take the seven-year Shahid degree course. Applicants must have taken their GCSEs, or equivalent, and they will go on to become missionaries, or specialists in Islamic law or history.Their special purpose is to spread the word about the real and peaceful teachings of Islam “Love for all – hatred for none” as global ambassadors.Students are taught Persian, Urdu, Arabic and English, and their course includes comparative study of religions as well as keeping abreast of current affairs, doing sport and community work. Visitors were given guided tours of the grade II?listed building, which was a De Vere Venues Hotel up until its sale three years ago – and before that was the Olivetti training centre.Some of the treasures of the library were on display, including an ancient hand-written copy of the Quran. Share the post "Islam teaches ‘love for all’"